Sisters, Debbie, Joni and Kim (sister Kathy stepped away from the ensemble in 1989), are daughters of entrepreneur/actress Florez Sledge and acclaimed Broadway performer Edwin Sledge. Their grandmother, Viola Beatrix Hairston Williams, an accomplished lyric-opera soprano, provided unique vocal training to the siblings early on. Arranging for her granddaughters to perform at church events and community functions, the quartet were first introduced to the world as “Mrs. 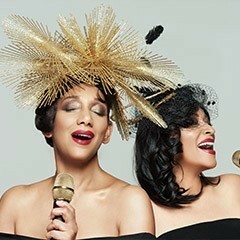 Williams Granddaughters.” Before long, they formed a band and with Debbie serving as vocal arranger, Joni as artistic director and Mom, Florez as manager, Sister Sledge was born.